Ben Rosenthal is a senior editor at Katherine Tegen Books, an imprint of HarperCollins Children’s Books. He acquires middle grade and YA fiction but also loves fresh and surprising nonfiction. I connected with Ben to find out more about his two breakout sessions at the Winter Conference, one on "Creating Nonfiction" and the other on "Thrillers and Mysteries." It was a great discussion, covering the lessons to be learned from fiction to nonfiction and vice-versa, the lines between MG, YA and Adult, and much more! 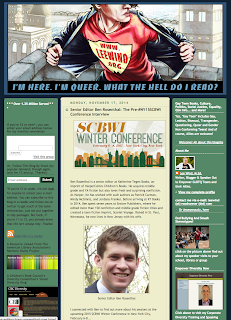 If you'd like to attend Ben's sessions and be part of all the craft, opportunity, inspiration, business and community of SCBWI's Winter Conference, we hope you'll join us in New York City, February 6-8, 2015.